Dr. Kalliopi K. Koufa is an Emeritus Professor of Law of the Aristotle University of Thessaloniki and Honorary Director of the Institute of International Public Law and International Relations of Thessaloniki. She is also a Member of the Council of Europe’s “European Commission for Democracy Through Law” (Venice Commission), in which she is representing Greece, President of the Hellenic Inter-ministerial Committee for the Implementation and Dissemination of International Humanitarian Law, and a titular member for life of the Bar Association of Thessaloniki. She was born in Thessaloniki and educated at “Peiramatikon” School and the American College “Anatolia” of Thessaloniki, Dr. Kalliopi Koufa pursued further her early education in the fields of English literature, French literature and History, at the then Regent Street Polytechnic of London, in England, and continued by studying Political Science at the Faculty of Economic and Social Sciences of the University of Geneva, as well as the Graduate Institute of International and Development Studies also in Geneva. She then, studied Law, at the Faculty of Law of the Aristotle University of Thessaloniki, where she achieved an LL.B. with distinction, an LL.M. in Public Law with honours, and her Ph.D. in International Law with honours. 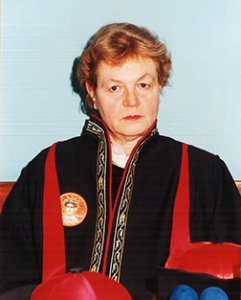 Kalliopi Koufa joined as a Barrister the Thessaloniki Bar Association, and a few months later was appointed as an Assistant Professor of the Chair of Public International Law at the Law Faculty of Aristotle University, where she served for over thirty years. In 1989, she became the first ever female Greek international laywer to be elected full Professor (with tenure) in Public International Law and International Organization at a Greek University. Professor Koufa is an internationally recognized legal scholar and theorist, whose extensive and diverse writings include monographs, books, studies, articles, working papers and reports for the United Nations and other International Organizations, book introductions and reviews, translations, advisory opinions and a voluminous editorial work. She has written in Greek, English, French and German, and part of her outstanding work has also been translated into other languages, including Spanish, Arabic, Russian, Chinese, Turkish and Romanian. Professor Koufa has also taught or lectured in a number of foreign countries, including Austria, Switzerland, France, Italy, Germany, Denmark, The Netherlands, and the USA. Furthermore, Professor Koufa is an experienced international practitioner of law. The broad range of her scholarship having also attracted attention within the Directorate of International Organizations of the Greek Ministry of Foreign Affairs, she was called to participate as a legal counsel and/or member of the Greek (diplomatic and other) Delegations in a great number of important international conferences and plenary sessions, as well as other meetings and working groups of institutional organs and bodies of various International Organizations, such as the Conference on Security and Cooperation in Europe (CSCE/OSCE), the Vienna World Conference on Human Rights, the Council of Europe, the International Committee of the Red Cross (ICRC), and, above all, the United Nations Organization (UNO). For more than fifteen consecutive years, she participated in the Plenary Sessions of the UN General Assembly in New York, as a Greek delegate to the Third and Sixth Committees, and also in the Plenary and other sessions of the UN Commission of Human Rights in Geneva, as a Greek delegate and an expert in human and minority rights.